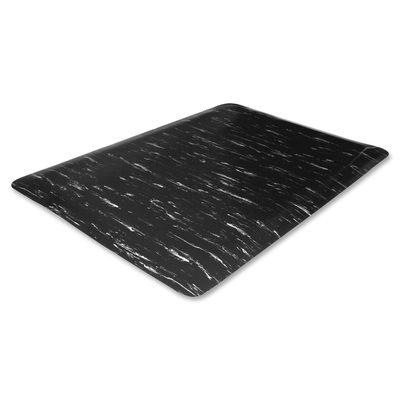 Anti-Fatigue Mat Helps Reduce Fatigue From Prolonged Standing And Increase Productivity. Ideal For General Office. Copiers. Teller Stations. Service Counters. Light-Industrial Dry-Area Assembly Lines. Airports And Banks. 1/2" Top Surface Is Puncture-Resistant And Flame-Resistant. High-Density Foam Backing Provides Superior Comfort. Beveled Edges Help Reduce Trips And Falls. Mat Is Easy To Clean. Simply Wipe With A Dry Or Damp Cloth Or Wash Top Surface With Water And Mild Soap..
Anti-Fatigue Mat Helps Reduce Fatigue From Prolonged Standing And Increase Productivity. Ideal For General Office; Copiers; Teller Stations; Service Counters; Light-Industrial Dry-Area Assembly Lines; Airports And Banks. 1/2" Top Surface Is Puncture-Resistant And Flame-Resistant. High-Density Foam Backing Provides Superior Comfort. Beveled Edges Help Reduce Trips And Falls. Mat Is Easy To Clean. Simply Wipe With A Dry Or Damp Cloth Or Wash Top Surface With Water And Mild Soap.